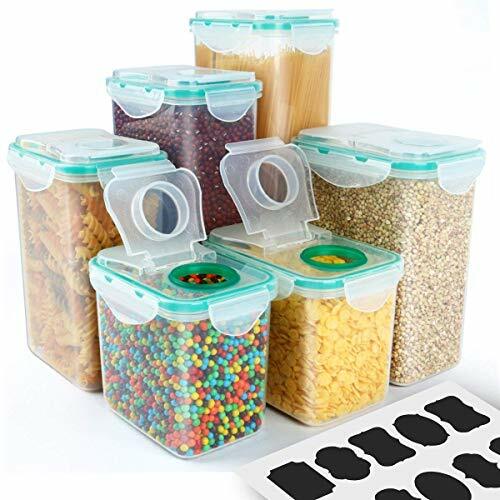 Amazon has the Cereal Container, VERONES Airtight Plastic Storage Containers Perfect for Food Storage Containers Kitchen Storage Containers (1.7 Inch Diameter Round Mouth Not for Big Cereal) 6-Pack marked down from $50.00 to $24.99. Get $8.75 off with code VERONES6 and score this for only $16.24 with free shipping. 🍋KEEP YOUR FOOD DRY & SAFE: VERONES Plastic Storage Container holds kitchen staples like flour, sugar, rice, nuts, beans, snack, food, cereal, coffee, and tea. 🍋FINEST QUALITY: All of the VERONES Food Storage Containers are made of high-quality BPA – free plastic. Food-safe and hygienic. 🍋AIRTIGHT LID SEAL: 4-sided locking system with silicone seal. Durable construction.Convenient food-storage container, 100% Airtight and watertight. 🍋EASY TO CLEAN: The lids are removable to allow better access to the jars’ interiors, and they’re 100% dishwasher safe! 🍋SEE-THROUGH DESIGN: The containers themselves are intelligently designed to be clear ,so that you can see what the contents are without the need of tags and notes.In the meantime,we are also considerate enough to send you 20pcs chalkboard labels. No worries about look alike food like milk powder and flour.